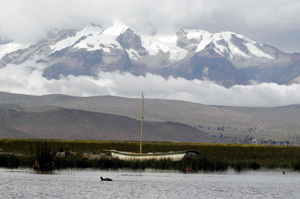 Climate change has direct consequences on Bolivia’s poorest, living in the mountainous regions of the Andes. Natural disasters have become more frequent and melting glaciers endanger the water supply. Caritas has set up model projects in four different climate zones to prevent droughts and flooding due to climate change. The main objective of the Caritas projects is to help farmers cope themselves with climate change. 35 villages from four different climate zones, the Nordyungas (Video), Beni (Video), Chapare (Video) and the Altiplano regions (Video), are taking part in the 18-month project. “In some villages, desperation seems to have taken over. You can hardly feel any energy that could spark renewal in those places. These villages have resigned themselves to the risk of natural disasters,” said Roberto Castillos, Project Coordinator in the Caritas Bolivia Disaster Prevention Programme. [Interview with Roberto Castillo]. The inhabitants of these regions perceive climate change very differently, depending on their different geographical, geological and social status. One village in the Nordyungas faces water shortages and has to save plants from withering. In another village, nearby in the same valley, people are cut off from the outside world for several months every year because of flooding. The creek running through the village becomes a torrential river. Children cannot attend school anymore, medical emergencies are not treated and mothers have to give birth without professional medical assistance. Caritas employees focus entirely on the local population. Together with the project coordinator, the villagers learn how to come up with solutions themselves. “Frequently, we have to get the villagers to understand that the situation is not exclusively determined by nature, but that they have the power to change it,” said Mr. Castillos. The projects are divided into three phases. In the first one, an intervention plan is worked out. Caritas employees gather with the villagers to analyze the situation. The main problems and possible solutions are pointed out. Experts are invited to give the farmers advice, teach them new techniques and skills. The objective is to turn the farmers themselves into experts about their territory, so that they can tackle the situation independently, not only today but also in the future. In a second time, the results of the analysis are applied together with the farmers. Different projects are implemented, for example the construction of a water canal or the set-up of a community basic health clinic. In the third phase, in cooperation with Caritas, the farmers have set up an early warning system. It allows them to contact other villages by a two-way-radio and warn them about approaching threats. This also connects the villagers to the state-run disaster prevention institutions. Emergency plans are created, from basic first preventive measures up to an evacuation of the population. To enlarge the scope of the Caritas projects, the people involved communicate their results and methods to a larger audience through the Bolivian media. The surrounding villages, who do not receive direct help, should be able to apply the results for themselves. The Caritas project is supported by the German government.